Today, we are interviewing Jason. He is a freelance blogger and loves to write about guitars. He started his first website back in 2001 and his website has seen quite a few iterations before finally choosing our Schema theme. 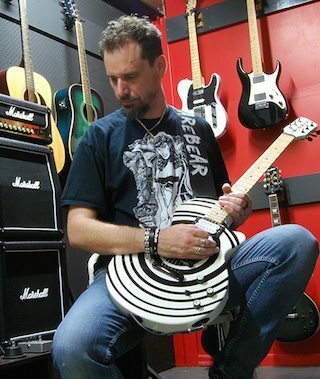 My name is Jason and I’m a freelance blogger with a passion for all-things guitar related. I’ve had my Scarebear website since around 2001. It’s been the guitar related website it currently is since early 2011 though. The first ten years were all custom website builds of my own making and the focus of the content was all graphic/web design. As I stopped freelancing and began working for other companies, I shifted the focus of the website to my guitar fascination. Since then I’ve gone from one CMS to another. I’ve found my home in WordPress. I was looking for high quality and responsive WordPress themes on the Internet and I came across MyThemeShop fairly quickly. Google served me well. To be honest, I was blown away by the flexibility the MyThemeShop templates displayed in their demo sites. The responsiveness was also amazing. It was the perfect combination between design and functionality. I’m actually using three MyThemeShop themes currently. The main one is Schema on my www.scarebear.rocks website. I’m also using Yosemite on my www.inkreadable.org website. I was initially drawn to the Schema theme because it closely resembled a design I had originally put together myself. My initial plan when redesigning my website was to create my own WordPress theme (the website had been a Drupal website for the previous two years in a theme of my own creation). When I discovered Schema and saw how complete it was and how affordable it was, the decision was simple. I haven’t looked back since. I’d love to see a few more options for article images in the Schema theme mostly. For example I’d love to see the preview image that is displayed on the home page at the top of the full article page. It’s a small feature to include, but it could make a big difference to each page on my website. Twitter. I’m really addicted to that social network. Every MyThemeShop theme I’ve purchased/tried has done exactly what the demo suggested it would do. I’ve found the installation process and the upgrade process to be pain free and simple. I have used the support network once when I was having difficulty with one feature on a theme and the responses I received were fast and clear. My issue (which was at my end I’m sad to say) was resolved quickly. I’ve not required any support assistance since. Thanks a lot Jason, for sharing with us.